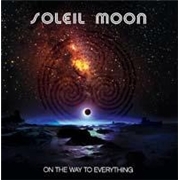 SOLEIL MOON is a duo consisting of Larry King of MICHAEL THOMPSON BAND and well travelled keyboard player John Blasucci, who has played with most of the pop rock world stars. They debuted in 1999 with “Worlds Apart”, and became a name in Adult Contemporary rock. Apparently the new single “History Repeats Its Pages” so this project band is to be taken seriously. The single is the opening track, and it is a well-arranged soft melodic piece with many instrumental layers and a slight MICHAL BOLTON-vibe. The band specialty is really soft and engaging songs that are augmented by really lingering refrains and supreme musicians, like MICHAEL THOMPSON, being involved. The opening four tracks are in no way bad, but they, and absolutely the title track, are nowhere near the best on offer. The really emotional intelligently blown ballad “Goodnight Irene” and the somewhat JOHN WAITE-like storytelling of “Freedom” are the monumentally best songs on the album, apart from the bonus tracks. SOLIEIL MOON effortlessly swagger from pop to Westcoast to AOR. They have arranged some of the finest songs of 2012 in the soft genre, and all this with almost no PR or other company tricks. The bonus tracks are culled off their 1999 debut, including the perhaps paramount efforts on the disc. Both “Ohio” and “I´d Die for You” are top-notch, while “Calling on the World” is much more pedestrian in comparison. All in all this is one for my Best of 2012!